On the tuesday we travelled east to Höfn and then back to the hotel at Kirkjubæjarklaustir. It's hard to do justice to this day, as though it was one of the best on the trip, and the scenery was fantastic, there were only a couple of stops! East of Kirkjubæjarklaustir is the Sandur. It's hard to do this place justice, it's a flat open expanse, stretching for miles in all directions. 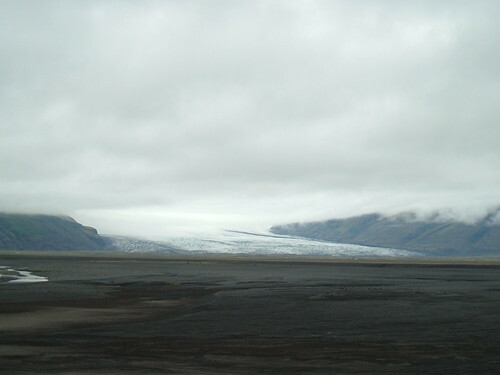 Occasionally there is volcanic activity under the glacier, this causes a melt, and when the water bursts forth from beneath the glacier it washes everything before it, sweeping the landscape clean. The peak flow in 1996 was some 50000 cubic metres per second. That's phenomenal. Such an event is called a jökulhlaup. 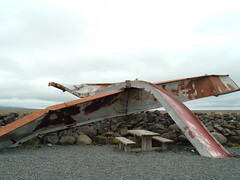 Highway 1, the road we were travelling on, was 'interrupted' at the last event, and by the side of the road they've left some girders which are from a bridge destroyed in the jökulhlaup of 1996 - it really brings home the strength of the waters. A little further on from the girders, one can walk alongside the glacier at Svinafellsjökull, right at the end, the glacier was a little grubby, but a little further up one can see the blues of the ice. I don't want to give the impression that Iceland is full of Ice - it isn't. 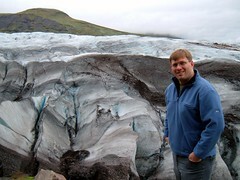 It has glaciers, true, but the majority of the country is lush and green, or dark and volcanic! Our next stop was Jökulsárlón. This is a lagoon fed by the Vatnajökull glacier. The glacier breaks into icebergs, which sit in the lagoon until small enough to get through the narrow channel and out to sea. At Vatnajökull there is a tea room, toilets and Icebergs. 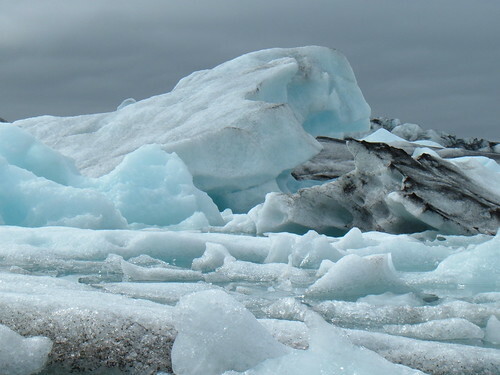 One can take a ride in an amphibious vehicle out among the Icebergs, but honestly we didn't see the point, as they come right up to the shoreline (virtually). 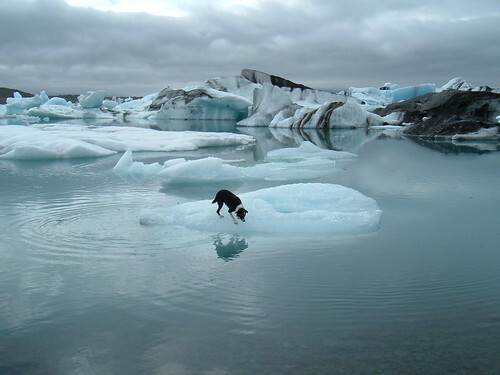 At one point, a guy was throwing stones into the water, and his border collie ran after one, climbing onto a small iceberg, it didn't know how to return without getting cold and wet, and so ran back and forth looking for a way out before taking the plunge. This was most amusing. From here we headed up to Höfn, giving a lift to some French people we met. The woman was to stay in Iceland for a year to study geology and Icelandic, she can speak Danish and English as well. We didn't see much in Höfn, as things were closing, so we turned around fairly soon and headed back, stopping for a break at Jökulsárlón once more (the evening light gave it a whole different look, one that I couldn't really capture on camera to my satisfaction). The views east of Jökulsárlón were pretty nice, but in hindsight, we should have turned at Jökulsárlón as this would have given us time to explore some of Skaftafell National Park. Ah well, we have to leave something for the future! Back in Kirkjubæjarklaustir we ate at the Systra kaffi, to get to this one takes exit at the roundabout which puts the Esso garage on the left of the car. The place stays open late (midnight), and is relatively cheap (though still expensive by non-Icelandic standards). The food is pretty good too. Monica had a fish dish, and I had a bacon burger (good stuff, not a scrotumburger in any sense!) There were all the trimmings, salad etc.